I’ll start this post with a little tale from my childhood that I have never forgot. As with every Christmas at the time, Granny had come over on Christmas Eve and my brother and myself were sharing his bedroom. Christmas morning we got up early to open our presents, the big exciting ones 1st, then I opened my present from granny and was instantly in love. The present was so simple, a little homemade pom-pom mouse made out of black and white wool, despite having some expensive presents that year, this little, scruffy black and white pom-pom mouse and me were inseparable. After Christmas dinner we sat watching telly in front of a roaring open fire. I don’t know why but I started playing around with my pom-pom mouse by throwing him up in to the air and seeing how close I could get him to the ceiling without actually hitting it and then catching him again. My father jumped out of his chair, grabbed my mouse out of the fire but it was too late. The wool my granny had made my pompom mouse out of was a synthetic wool and the fire had effectively melted it rather than just burning it – I was heartbroken. A good 45 years plus later and I had a business called Best Years register in my Business Directory – Best Years Listing. I went to have a look at their website, saw that they had a collection of knitted and crochet toys and the memories of my little pom pom mouse came flooding back. I emailed the lady who added the listing telling her how her toys had bought all my childhood memories back, told her the tale of my little pom pom mouse and was pleased to get a nice reply back. Jump forward another couple of months and she emailed me with a question about her listing, I looked at the Best Years website again and this time couldn’t resist. Explaining it was a present and I needed it pretty quickly I asked the lady if it would arrive in time and was reassured that it would. Just 2 days later a knock on the door and there was the postman with our Woolly Mammoth. The Best Years Mammoth was absolutely gorgeous, even better than how he looked on the website my problem was am I really going to be able to give him away? I was thinking, I’ll keep him for myself and get our nephew something else from in town when there was a knock on the door. I opened the door to find my wife’s sister, my children’s aunty, the mother of the nephew I had bought the mammoth for – The decision was made for me, she saw the mammoth and said that’s lovely and Benjamin would love it. 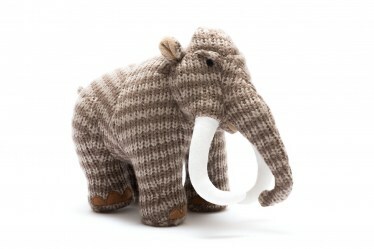 Yep, my cunning plan now is to get one of our kids to buy my wife a Best Years Mammoth for Mothers Day.